Well I thought our car troubles were over, but it turned out they were only beginning. A few days after the new injector was installed the car started sounding rough again so we took it back for Fred, the mechanic to take another look at it. After a brief examination he though he saw sparks coming from one of the coils and anticipated that the housing was cracked. By this time we've learned the routine and head back to the parts store to get a new coil. The garage and the parts store are on the same street just a few blocks apart, and this time, although the engine sounds bad, we can at least still drive it to get the parts. We are fortunate that Fred is willing to drop what he's doing to work on our car and he proceeds to remove the old coil. Sure enough, it has a couple of cracks in it, but when he attempts to use the new coil he realizes that we have been sold the wrong part and this one won't fit on our car so he has to pull one out of stock. That's all right because this particular part is only about $10 more. The new part is installed and Fred starts plugging in the spark plug wires, only for some reason one of them doesn't make a solid connection. He pushes the wire further into the boot so that the connector inside is closer to the end. That's normally what you would do. While we are watching, he still has trouble getting it to connect so instead of fighting with it he sticks needle nose pliers inside the boot and pulls the connector up, which is good, and out, which is not so good. He gets the connector on and jams the boot over top of it. So half an hour later it's connected, but not very well. Everything gets put back together and the car runs, but it's noisy and he assures us that it's just because the battery had been disconnected while he was working on it and the computer has to relearn everything. He suggests that maybe there's a problem with the spark plug wires (Well I guess, Bozo!) and maybe we ought to replace them. The wrong part gets taken back to the store and we come home with the car chugging just like it did when we took it in. When we get home and inspect the old coil and see that although there is a crack in the housing, it's just on the surface and doesn't go right through. We test it with the meter and it appears to be OK. So it looks like we replaced a part that didn't need replacing. The only way to know for sure is to swap it out with one of the other coils and see what happens, but that's a lot of work and we already have a lot to do. We check in with the garage around the corner and ask if they have an old spark plug wire we can use for testing. We put new wires and spark plugs on last year and we don't drive much so the wires should be OK. We use the test wire and use it to replace each wire one at a time. Everything checks out OK but just in case we bicycle back up to Canadian Tire and get a new set of spark plug wires. I don't pay a lot of attention to car engines but I've seen some where the spark plugs are all lined up across the top of the engine. Ours aren't. 3 of them are along the bottom front, but 3 of them are behind the engine along the back between the engine and the fire wall. The only way to get to them is to remove the alternator which you can't do unless you remove the drive belt. 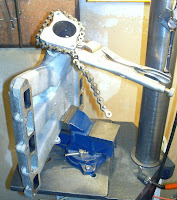 Garages have a special tool for the purpose, but Rob has done this so often he made his own. It's like a metal yard stick with a bolt on the end that you can use to spring down the bracket and release the belt. Then it's just removing a few bolts and the alternator can be lifted out of the way. Rob's not a mechanic, but one of his first jobs was working on the assembly line building car engines, so he knows more about what makes cars go than the average guy. We carefully test the continuity of each new wire to make sure they're all OK, then we remove the old set, clean and gap the spark plugs and replace each wire neatly fitting everything into the harness and wrapping the protective coils around them at the places where the wires lay close to the engine. The alternator goes back in place and gets bolted down, the battery gets re-connected and we give it a try. No change, it still sputters. That means that we have another problem inside the engine. This time we've already seen the engine apart and Rob is confident that he can do the job himself so he started taking the engine apart. There's a lot of "stuff" attached to an engine that you have to remove before you can even unbolt the plenum and lift it off to look inside. All of the sensors and the intake manifold have to be removed and held out of the way while you work. Then the wires to the fuel injectors have to be removed and the fuel rail unbolted. The hose ends are capped with rubber stoppers so that we don't leak gas all over the place. We have already tested and know that the spark is getting through to the fuel injectors so we take them off and test them one at a time. I don't know anything about this stuff, but my job is to be a third hand and hold things. Hold things out of the way so that other parts can be reached, hold bits and pieces as they are removed or replaced and hold parts or probes as things are being tested. 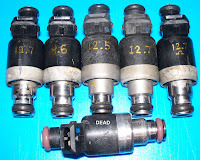 The fuel injectors read 12 except for one which reads 8 and the new one just installed which reads 0. Zero, and it's new. We can tell it's the new one because all of the previously installed fuel injectors have black O rings. The new unit has a red O ring. Rob takes pictures of everything. He scans the important information on the sides of boxes and takes pictures of all of the parts that he puts on. He also takes pictures of the things he takes apart. It's easier to take a picture and know which order things are in than it is to try to remember when you are reassembling. We know the new injector had the red O ring because we have the picture of it, in the box, that we took in the store, when we bought it. The good news is that we know what's wrong and how to fix it. The bad news is that the store that has the parts is 7 km away and the engine is apart. Before we go back to the store we call to tell them what has happened and that we will be in to return it. In the interim a friend emails us to say that the company he works for has all the parts and he can get them for us much cheaper because he gets an employee discount. So we return the bad injector and get the refund then bicycle on to the next shop to pick up 2 new injectors and a couple of other pieces we need and back home again. The new injectors get installed and we start replacing pieces in reverse order. Since we have the wires out of the engine we take the time to test each wire and carefully re-tape them and replace the old brittle wire coil with new. We get ready to hook the fuel line back up and realize we have a major problem. 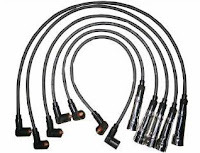 The flexible rubber hose that connects to the engine has a metal fitting, kind of like at the end of a garden hose, that screws onto the pipe going into the engine. It's a special kind of rubber hose that can withstand the high temperature and high pressure going into the engine and it has small split right at the fitting. If the split was in the middle of the hose we could just cut the hose, insert a connector and hold the pieces together with fuel clamps, but where it is there isn't anything we can do to fix it. No hose, no car. This new problem is worse than all of the others combined because if we can't get a hose we can't repair the car. So we start calling first the dealer, because some things don't change and they might still use the same type of hose in newer cars. No luck there, they don't use that particular fitting any more. Then we try the after market stores, they don't carry it either, so we go to the recycling stores and see what we can find there. Our options are limited because most junk yards are on the outskirts of the city in remote areas and without the car working we only go where we can bicycle to unless we can get someone else to drive us out to get the parts in the middle of the day. One shop doesn't have anything but one of the guys who works there thinks he might have a hose and he's willing to drop it off at the house. He dropped by with a hose which was unfortunately too short, but after he sees the car and where it needs to fit he thinks he can get one. Thankfully he did, and after some adjustment the hose was attached. Now it's just a matter of finishing off the re-assembly of the engine and we're good to go. Just to be safe Rob checks to make sure how tight the plenum needs to be and he finds that it should be torqued to 25 ft/lbs and he carefully torques each bolt in sequence. There is a specific order for these things although a lot of mechanics don't bother doing it properly, Rob always does. The last bolt is bolted the last clip is clipped and and the battery is re-connected. Then we get to turn the engine over and see if it runs. After a few little sputters as the air in the gas line gets moved through the system the engine roars to life. Success at last! I start supper and he takes it around the block to check it out. After supper we decide to take it for a slightly longer drive so that the computer can re-learn the system. Rob starts the car and there's a loud clang and the car starts backfiring. That's n ot good. Back under the hood again to see what's happening. Really, REALLY bad news. The plenum is cracked. The plenum is the top of the engine. It locks down over top of the engine and created the vacuum that makes the engine work. 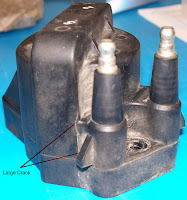 The backfiring is caused because there is no vacuum when the plenum cracked. At this point most people would give up. "Give up" isn't in hubby's vocabulary. After looking at it he figures that if he can find some way to secure the broken piece back onto the plenum, that he may be able to get it working well enough to drive. He needs to be able to hold both pieces together accurately and tightly while he drills through both pieces. Then he has to use a drill bit long enough to drill through the side of the plenum without damaging the surface of it, because once the repair is completed the surface needs to be totally smooth and flat or it will leak air. Not having a drill bit long enough he first has to make one by inserting a bit into a rod and securing it with a pin through the side. Once that is accomplished he needs to find a way of holding the pieces together. This gizmo is apparently called a chain grip. It's kind of like a vise grip with a bicycle chain where the gripping part is usually found. I wonder if the guy who invented it need to fix an odd shaped part like this? It held the pieces firmly in place while two tiny holes were drilled. The holes were tapped and heat treated bolts inserted and tightened down. Miracle of miracles, it worked! The repaired plenum was bolted into place with some liquid gasket used along all of the seam lines of the repair. Once again we tried it out. Vroom, VROOM. We have car! We're not stupid enough to press our luck, the next day we head out to the recycling yard, They used to call them junk yards, but we're so much more environmentally conscious these days. The have another Z24 with an intact plenum, we just have to disassemble the car to get to it. While we're at it we pick up all of the other little bits we need like hoses and clips that are broken on our car. Hey, we're getting good at this,we can disassemble and reassemble the engine faster than a garage mechanic. We know where all the little bits go and the easiest way to get them in place....AND I HOPE WE NEVER HAVE TO DO IT AGAIN!!!!!!!!!! I admire your persistence! I have a headache just from reading all you went through. LOL I'm glad it went from "boom" to "varoom"
My husband wondered why I kept saying 'Wow', and I told him I really didn't have the strength to read it to him! I now realize that our 'problems' fixing the GTO a few years ago (new carburetor, radiator) were NOTHING compared to this! The car ran pretty rough after the new radiator was put in, but it was because things weren't put back correctly, and spark plugs weren't good. I also thought it was a big deal that one of the sparkplugs had to have a special bend in it, and we had to hunt for the correct one. We're very lucky to have a cousin who can put together 40-year-old carburetors, but as I watched him take it apart, I was sure the car would never run again. Also our cousin brought over some kind of calibrating machine and checked out various things about torque, etc., etc. He'd understand everything you said! I think I'll take an aspirin now. Wow Sharon, I must have missed this post, but don't know how. My DH would know all about what you have gone through, he has done it more then once for tractors and trucks on our farm. How is your car running now? Hope it purrs for a long time.